The classic Disney movie is brought to life in Beauty and the Beast – Live on Stage. Watch Belle fall in love with a horrible Beast as she resists the advances of the vile, selfish Gaston. The show features Chip, Mrs. Potts, Cogsworth, Lumiere and the beautiful Disney dance troupe. The easiest show to score quality seats with little waiting is the first show. Otherwise, arrive 15 to 20 minutes early for the best seats. This show rarely fills to capacity. Fantasmic! is Hollywood Studios’ evening spectacular. It is held in a 10,000 seat outdoor amphitheater, so the show could be cancelled in the event of lightning. You’ll see Mickey Mouse use all the powers of his imagination to overcome the worst Disney villains. The show uses water screen technology, live performers, characters, lighting, lasers and pyrotechnics to tell the story. Arrive an hour early or attend the later show when it is offered to avoid crowded conditions. Some restaurants offer Fantasmic! dining packages that provide reserved seats. Small children may be affected by the intensity of the show. 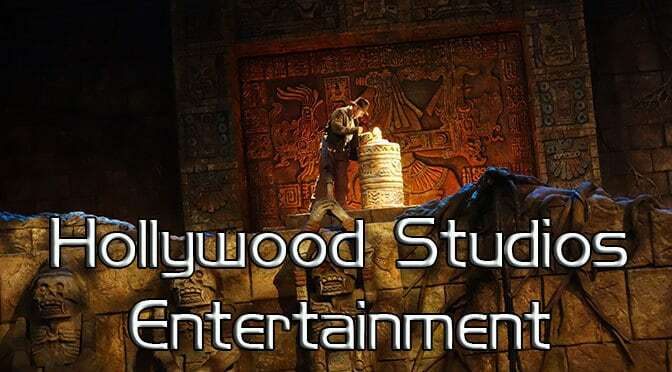 The Indy Jones Epic Stunt Show is an original icon of Hollywood Studios. It displays three scenes from the original Raiders of the Lost Ark. You will see the idol and rolling ball scene, the fight scene and the airplane scene with climatic explosions. Willing adult volunteers can become part of the actual show. It is a terrific show and Indiana Jones often meets following the show with a few guests who are willing to wait. The theater only holds about 2,000 people, so arrive early for a good seat. I would recommend 15-30 minutes prior to the next show. Parts of the show or the entire show may be cancelled in inclement weather. Watch Darth Vader and the Seventh Sister battle it out with young Padawan learners. The Padawans are accepted first come, first served early in the morning. To sign up your child 4 to 12 years of age, take them to the Indiana Jones store at park opening. Captain Phasma leads her First Order Storm Troopers on a March from Star Wars Launch Bay to the main stage and provides a brief show, setting the tone for the Far, Far Away show. Guests are not allowed to sit inside the taped marching areas. Arrive 30 minutes early for front row and 20 minutes early for decent close view. Otherwise watch screens from distance. Kids can’t see much of the action, so many parents hold them on their shoulders, which can ruin your view. Arrive at least 15 minutes before a show begins or use Fasptass+. It’s easy to get this as a 4th or subsequent FP+ in the park. The Voyage of the Little Mermaid uses blacklight puppetry to tell the story of the Little Mermaid. People of all ages love this attraction. Arrive a few minutes early for each continuous show. The show offers FASTPASS seasonally. Hi Kenny – Similar question to above. We’re going to DW in Aug 2018 and it looks like Star Wars fireworks aren’t showing up. Is it just that they haven’t put it up yet or is it not playing in August (on the site, its showing through July). Thanks! Hi, if the park hours are schedule from 9am to 9pm and fantasmic only at 830. Is it possible to catch most of the star wars fireworks show after fantasmic? Or we shouldnt mind to rush to it? Any word on whether the Star Wars fireworks will still be presented in October? Thanks for quick response! Is galactic spectacular typically each night, too? Planning a trip for a friend. It will be their first trip. They have boys who will be 10 and 6. A lot of people are warning her that they don’t think her boys will like magic kingdom. I think they will. Thoughts? Trying to recommend unique dining or entertainment experiences boys might like. They will be there in October for the Not so scary Halloween. What are the typical nights for the Fantasmic show in the Fall? I know this is speculation on your part, but thought you might have historic records. No Fantasmic shows or Star Wars fireworks are shown on the calendar for May 2017. Do you think that these will be added for that month? We’re visiting Oct 16-21 2016 and noticed you don’t show any Star Wars: A Galactic Spectacular Fireworks in October – is this a limited time engagement or have fall dates not been posted yet? I’ve got 2 little Star Wars fans who want to do as much as possible. Thanks! What are the times for the jedi training? every half hour? Do they still have the disney jr. Dance party during EMI at HS? Just heard today it was discontinued a few weeks ago. Where is the best place to watch the Symphony in the Stars fireworks show? We’re planning an early day at Hollywood studios in July with an afternoon break for the little ones and returning around 6:00 p.m. for dinner, our evening frozen fast pass and fantasmic first showing (dining package). Based on the current schedule for shows we will have to do the first Beauty and the Beast show (no fastpass). My question is, if we do the 11:45 show, will be able to make it to the Indiana Jones show at 12:30 (no fastpass)? As usual, your thoughts are appreciated. July 7th. Frozen Fireworks(9:45)+Fantasmic(9 or10:30)! Plan of attack??? Fantasmic Dining Pckg? Frozen Pckg????? What to do what to do…..HELP! Fant 10:30 no package needed. Just curious how much variance there is to the weekly schedule each week or month. Largely similar at HS, but they can add shows in busier times. Magic Kingdom is like shooting a moving target some times. We are planning a trip to the parks for august 13th to the 26th…any chance on getting show schedules that far in advance? Schedules are released by Disney every Saturday night for the following week. Do you know if they will still have the Disney Junior EMH Dance Party while the Disney Junior Live on Stage show is closed for refurbishment?